BetDSI is an online bookmaker which is licensed and operates under the jurisdiction of Costa Rica. The company was created in 1998, and their online platform was launched in 2001. Their headquarters are located in San Jose, Costa Rice. The top management figures in the company are Mickey- Director and A. Torres- Customer service manager. Operating for more than 17 years has earned the company the trust of users from more than 140 countries around the world. Most bookmaker review sites give an A+ grade for their services. The platform offers a Sportsbook, Casino, Racebook and a Poker room. Players from France and Costa Rica are not allowed to register on the site. But users from all other countries are free to join whenever they want. Despite the fact that Costa Rican betting sites are known for their old platforms and many scam schemes, BetDSI has kept their service top notch and as honest as it can be. Users have left many positive reviews about their customer service and payouts. The bookie invests heavily in innovative technologies and a modern future proof betting platform. 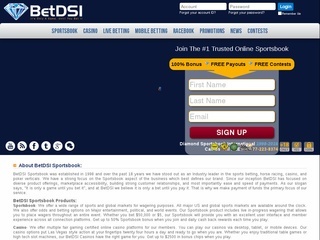 All in all, BetDSI is very decent bookmaker with lots of great markets and flawless user support. The platform itself is very simple and user-friendly and even people who have never used one will understand it quickly. While it doesn’t have a very flashy design, it does offer the usability of a modern online betting site. The Sportsbook offer covers most of the major sports like Soccer, Basketball and Tennis. E-sports are also present which is nice to see in a nowadays bookmaker. You can also place a wager on the primary entertainment and political events. Live betting is supported, but sadly there is no Live streaming. Mobile users will be glad to know that the platform offers a mobile version of the site that doesn’t need any downloads or installations. It’s not the most practical one in the industry, but it does the job. Offered markets are totals, money lines and over/under. You have If bets, reverse bets, action points and online withdrawal. Soccer dominates the markets department with over 500 wagers available at almost any time. You have plenty of options in the Futures menu where you can find all major sports and the odds for them. BetDSI customer support is top notch with 24/7 customer service available. Live chat is present, and users can ask their questions whenever they like. Response time is very quick, and users have left only positive reviews about their betting experience. The staff is very well trained and polite. They offer two phone lines, one international and one domestic for everyone who likes to get in touch with a company’s representative. It seems that the company is giving their all as far as customer support is concerned. Supported languages are English, Spanish, Vietnamese and Chinese. The platform uses the latest SSL protocol to protect their users’ data. They have made sure that users’ personal data and other information are kept safe. Depositing money into your BetDSI is as easy as it gets. Accepted currencies are more than 10 with most major ones (like US Dollar and Euro) present. Minimum deposit amount depends on the chosen banking method and goes from $10 (for Bitcoin) to $2500 (for Bank Wire). Minimum withdrawal is set from $25 to $3000. Processing time for the withdrawal is usually 1-3 business days (7-10 for Bank Wire and Bank Draft). The company doesn’t charge for any transactions made (deposits or withdrawals). BetDSI is really thinking about their clients and how to keep them satisfied at all times. They offer a ton of promotions and contests that their users can enjoy. Welcome bonus 100% has the option to be divided to 50% sports + 50% casino bonuses up to $500 each. Some of the promotions are the 20% bonus, the $2500 bonus, their current 100% Super Bowl sign up promotion, Referral Bonus, Horse rebate and many more. In fact, you’ll have to check up for their promo codes almost every week to see their new offer. What catches the eye when you browse their promotion offers is their Free Streak Contest. There you can win to up to $25 000 if you make 21 consecutive correct selections. And the best part is you win this in cash (not free bets). Of course, this is the top prize, but there are many others for 5, 9, 13 and 17 correct selections. A monthly wins leader will collect the prize of $1000 free to play money with a 5x rollover requirement. As mentioned these are just some of the many bonuses the site has to offer. You’ll have to check their new offers now and then to see what else you can win. There is also a Bitcoin bonus – deposit using bitcoin as a cryptocurrency and get 30% Bonus on every reload deposit. If you feel that BetDSI is your desired bookmaker, check them out you’ll be pleasantly surprised!